We were, however, able to locate the elephants immediately utilising the GPS collar which ERP had recently fitted onto the older bull, infamously named ‘Charles’, who was leading the breeding herd of 7 cows and calves on the dangerous spree. The ERP team responded without delay and were the first people on the scene (within 45 minutes of the initial call) to assess the situation. The reserve’s management team joined us shortly thereafter as the sun was rising, providing much-needed light for us to obtain a visual of the elephant herd. At this point, we were only able to see clear clues that the elephant had been in the area. They had snacked on oranges, prickly pears and a few other scrumptious treats which they could not get their trunks on within the reserve, leaving us the remains as a means to follow them. Within 30 minutes, the team had visuals of the elephant who was still on a very brisk walk to a destination only be known to themselves. A light aircraft, carrying an ERP team member was called into the area to ensure that we could maintain visuals of the elephants until they could be secured in an area so that a relocation plan could be formulated. This was achieved by surrounding the herd with vehicles at unobtrusive distances and by 08:00 the situation was stabilised and the elephants were secured in a safe, densely bushed area. It was deemed that the helicopter option would place too much pressure on the elephants and cause them to split from their tightly knit group and the capture of elephants is always considered the last option as the elephants need to be sedated over a long period of time, causing significant stress on the animals. 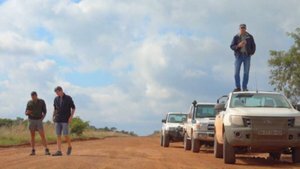 After much consultation with other industry specialists, the ERP team and the reserve management team made a final decision to ‘walk’ the elephants back to the reserve. This was no ordinary task considering the distance and terrain which the elephants needed to cross to eventually get home (16 km of undulating hills). The elephants crossed mountains, cleared valleys and went from one property to the next until they arrived at the Moloto Road, a notoriously dangerous and busy road, especially on an Easter Sunday evening like this. The team had however arranged with Provincial Traffic Police to establish temporary roadblocks to allow safe passage for the elephant. After tracking the elephant in the dark, utilising vehicles and telemetry equipment, the team managed to identify an area where the elephants were going to cross and the road was blocked off for at least 20 minutes, creating traffic jams on either side of the barriers. The elephants however crossed as planned and disappeared into the darkness, pursing their track home. We followed the elephants for another 7km to a point where it seemed they would be resting for the night. The walk was paused at 03:30 AM on the 18th April, almost 24 hours after it was started. The elephants did not move, almost as though they were giving us a chance to rest. The rest, however, did not last for very long and we were back on the road by 05:00 when the elephants started moving again. It first appeared as though they were moving away from the reserve and with a sudden change direction they were back on track to get to the reserve in a few hours.